5 | 508 students enrolled. Certification in Online Options Strategies course is jointly certified by NSE Academy & Elearnmarkets (NSE Academy is a subsidiary of National Stock Exchange of India). Options are a versatile financial instrument. Though, options can be complicated and risky, a methodical and an outright knowledge about it will cut your losses and protect your gains. 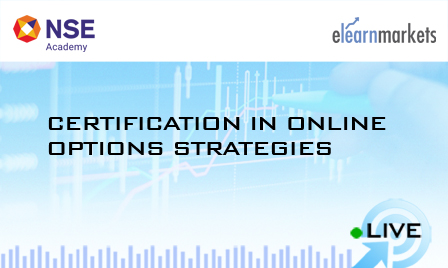 Certification in Online Options Strategies aids in understanding the employment of Options which are used world over to hedge not only the portfolio risk but also to maximize the return on investments. The study focuses on different kind of Options, and options trading strategies that offers a wealth of possibilities to the market participants provided they take well-elaborated and research-backed decisions. By learning options trading the participants can profit from any market condition. They can discover new trading opportunities and the various ways of diversifying their investment portfolio with a bright financial futures. To trade Options, you will have to know the terminology associated with the Options market. This course nicely spins around such technical terms about which you still may be ignorant. Options Trading course aims to teach the participants to build their own options trading strategy with sophisticated approaches to preserve and build capital. The leverage and volatility of options trading can create dramatic results with small amounts of capital only on a good tutorial. The incumbents learn to practice the requisite skills to identify, assess and execute trading opportunities in options in order to create, manage and evolve various strategies and produce consistent profits from Options Trading.The proper learning of the option trading strategies taught in the course will help you make money regardless of the direction of the stock market . Students enrolling for Certification in Online Options Strategies program will be given a “Certificate of Completion” from NSE Academy, facilitated by Kredent Academy. The participants will also be given free access to all webinars conducted by Kredent Academy for further knowledge enhancement. The students can post all their queries in the discussion forum while pursuing the course. Certification in Online Options Strategies course greatly benefits aspiring traders, teachers, students coming from both commerce and non commerce background, investors and also anyone who is interested in derivatives market. Under this course “Certification in Online Options Strategies”, the participant will be required to appear for the internal examination and NCFM examination. Please note that the participant will get the Certificate of Completion of Certification in Online Options Strategies after successfully clearing both the examinations. NSE Academy certification in Financial Market (NCFM) Examination: This examination is hosted by NSE for which you need to go to the NSE approved test centre. The participants have to appear for the NCFM Options Trading Strategies Module, preferably within 45 days after the completion of the module/ course. Once the student enrolls in the Certification in Online Options Strategies, he/she has to do NCFM registration. This is necessary in order to get the login credentials, so as to book the test date and the test centre to give the examination. Click here to register. The exam fees for the NCFM Options Trading Strategies Module is Rs 2,006 (two thousands six only) inclusive of service tax.